Thank You! 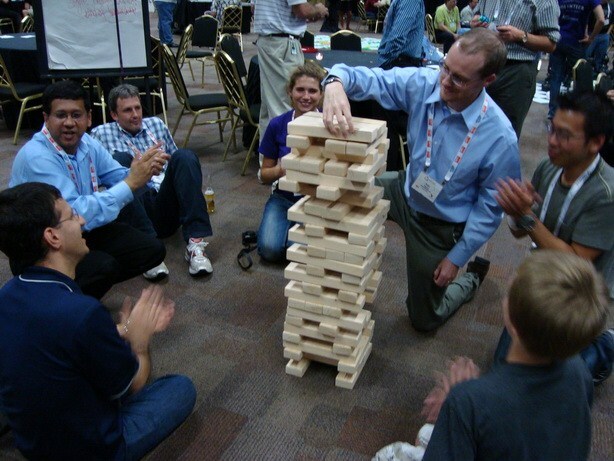 to Team Jenga (featuring Peter Yu, Syrous Delavari, Alex Dergousova, Boris and Kevin Mezick) for building the tallest Jenga tower at Agile 2009 by starting small! Thank You! to Peter Yu, Syrous Delavari, Alex Dergousova and Pascal for a fun-filled day-out in Chicago – involving sensory modern art and a philosophical discussion on what it means to be an optimist and how to become one. Thank You! 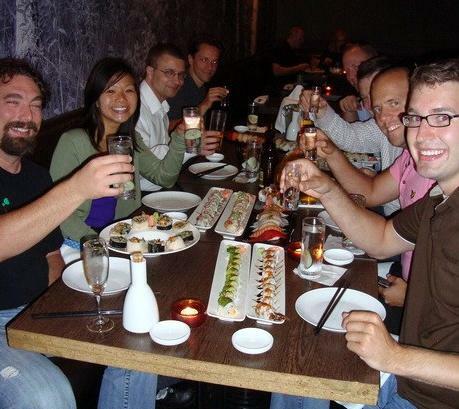 to Matthew Edwards for finding the best sushi restaurant I’ve ever been to and then an act of unexpected generosity – he treated a random bunch of strangers-now-new-found-friends to dinner! Thank You! to Matthew Edwards, Luke Amdor and Ola Ellnestam for a thought-provoking and hopeful conversation on what being agile means over dinner. Thank You! to Jenni Dow and Ole Jepsen for their enthusiasm and open-mindedness on all things kaizen! Thank You! to George Schlitz, Giora Morein and Brian Bozzuto for participating in The Bottleneck Game and The Business Value Game! Thank You! to Chris Sims for his big cheer of appreciation and support when he discovered that Pascal and I share all our games under the Creative Commons licence so that we can all have more fun and be more effective at work. Thank You! to Mark Striebeck for saying ‘Hello’ and doing the keynote at XPDay London 2009 – I’m looking forward to it. Thank You! to Dan Mezick for introducing me to the PMI community and suggesting Pascal and I share our games with them. Thank You! to Carsten Jakobsen for an enlightening conversation about CMMI and Agile and how they complement rather than compete with each other. Thank You! 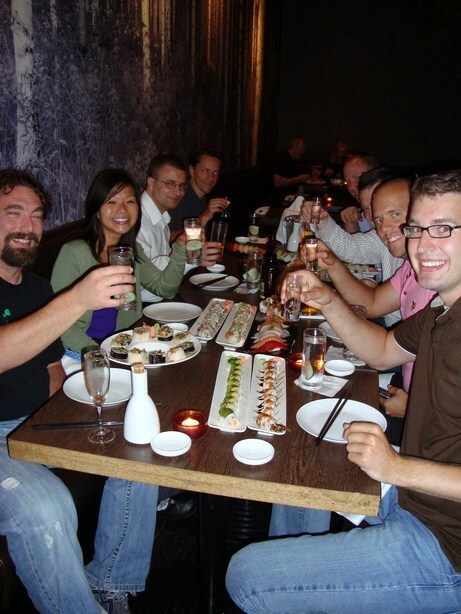 to Tsutomu Yasui and Ebacky for sharing The Kanban Game at Agile 2009! Thank You! to Christopher Avery for helping me better understand how to facilitate discussions about The Responsibility Model. Last, but not least, Thank You! to the organisers, presenters and participants of Agile 2009 for making it such a great conference for learning and sharing! 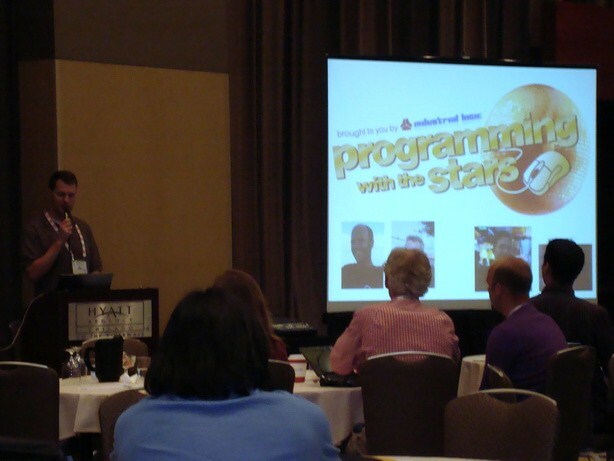 Agile 2009 has been an educational and uplifting conference for me. See for yourself! 1. Mapping the Agile Enablement Battlefield by George Schiltz and Giora Morein – A thought-provoking session on strategic thinking demonstrating The Mapping the Battlefield approach for identifying and dealing with influencers as part of Agile Enablement at an organizational level. 2. “Flirting” With Your Customers by Jenni Dow and Ole Jepsen – A fun, yet serious session introducing an 8-step model for creating rapport with your customer through effective communication. 4. How to Develop Your Leadership Power Daily: An Agile Approach to Growth by Christopher Avery – An introduction to The Responsibility Model as a personal responsibility and way of improving individual effectiveness. 5. The Bottleneck Game by Pascal Van Cauwenberghe and me – a simulation of a production line at The Hats and Boats Company where we learned to apply the Five Focusing Steps from the Theory of Constraints. Each of these sessions have three things in common: they are well-presented, thought-provoking and valuable for individual development and Agile team development. Day 1: The Ice Breaker Evening Event – The activities at the event, such as Giant Chess and Jenga, multiple wii game stations and an open space area, gave attendees a great reason to mingle and network. The Can-Do attitude of the conference helpers and presenters was a good example of collaboration in action. Day 4: Dinner Banquet – The quality of the dinner was superb for a meal served to a table of 8 let along for 1,400 diners. Day 4 Keynote “The Dawning of the Age of Experience” by Jared M. Spool – An entertaining and educational talk on the importance and relevance of user-centred design in our lives. Participants were exceptionally forthcoming with their session feedback which should help improve future runnings of the sessions. Watching Ola Ellnestam and Gerard Meszaros in the finals at Programming with the Stars reminded me of what software craftsmanship looks like in action! Discovering that The Business Value Game doesn’t make learning business value modelling sufficiently explicit. Getting better acquainted with old friends and making new friends. The city of Chicago provided numerous opportunities for promenades to relax the mind and re-charge the body after a day crammed with learning. Find a way for attendees to familiarise themselves with the programme quickly and easily (it took me at least an hour per day to decide on a session shortlist). Find a way of reminding attendees which sessions they attended to fuel meaningful conversations during the breaks. Create opportunities for the different types of attendees to cross-stage mingle instead of enforcing silos by primary interest. Kick off the conference with a facilitated ice breaker exercise to encourage mingling from the start. Intersperse the conference with ice breaker exercises to encourage more mingling throughout the conference. Introduce One-Minute-Presentations by session presenters at the start of every day (or every morning and every afternoon) so that attendees have more information on which to base their session choice. 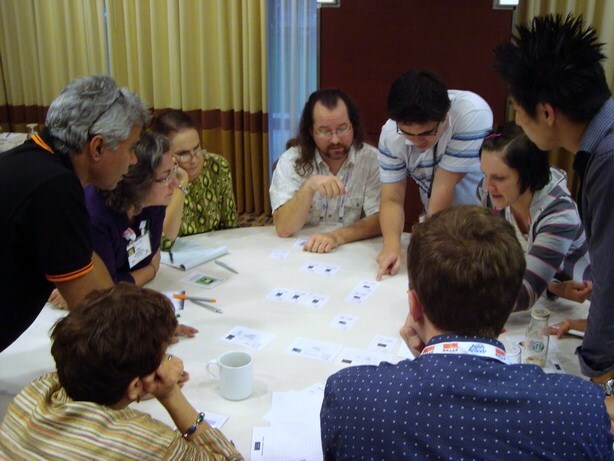 As Agile Adoption becomes increasingly widespread, Agile 2010 will be instrumental in enabling face-to-face knowledge sharing around the world. Agile 2009 proved to be such a hit that I’m already looking forward to next year’s conference in Nashville, Tennessee, home of country music. I hope this means there’ll be lots and lots of dancing. Best get practicing! Meanwhile, Thank You! and Goodbye for now. You are currently browsing the Selfish Programming archives for September, 2009.